It would be fitting if this turned out to be the final installment in the “Kung Fu Panda” series, because the moral of “Kung Fu Panda 3” is “And in the end, the love you take is equal to the love you make.” Those were the last words of the last song on Abbey Road, the last album the Beatles made together. (Yes, there is a snippet of a song after it called “Her Majesty,” but that was the engineer’s doing, and was never supposed to be on the final master tape.) It’s an excellent piece of advice, and makes for a very touching finale, but there is a sameness to these films that cannot be denied. Po is the animated, martial arts equivalent of Dr. Gregory House, the one who continues to get it wrong before finally getting it right. There is a great disturbance in the spirit realm, as the ox Kai (J.K. Simmons), a onetime friend of the recently deceased Master Oogway (Randall Duk Kim), is vanquishing all departed kung fu masters in order to steal their chi (think of it as channeling the energy of the universe) and use it to cross over to the mortal realm and continue his reign of terror. 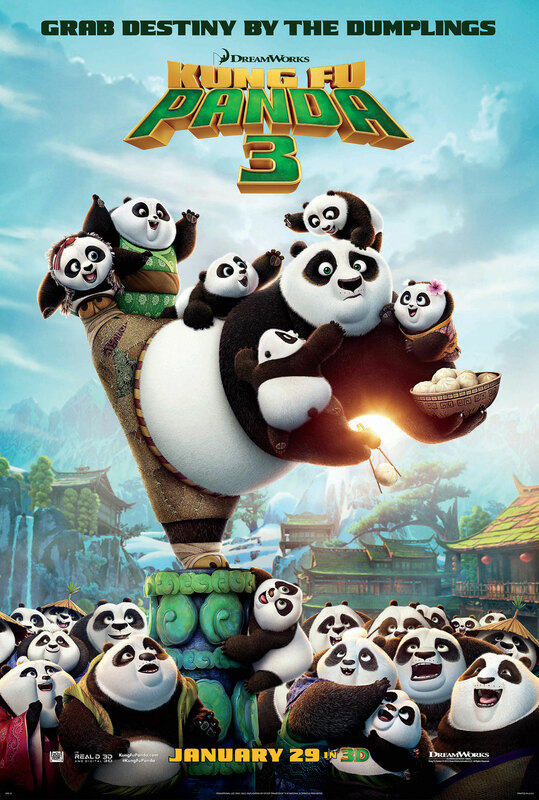 Oogway chose Po (Jack Black) to be the Dragon Warrior knowing that this was coming, though no one in the mortal realm has much faith that Po will succeed. Po also receives a visit from his biological father Li (Bryan Cranston), much to the consternation of his adoptive father Ping (James Hong). Li lives with a group of pandas in a hidden location, and he brings Po (and Ping, reluctantly) back with him to learn the art of chi, as well as how to be a proper panda. Po doesn’t have much time, though; soon after crossing over to the mortal realm, Kai makes short work of the Furious Five, save Tigress (Angelina Jolie), and is coming for Po. “Maleficent” seems scared of itself. There is a dark beauty that occasionally escapes, only to be squashed by clumsy and completely unnecessary attempts at humor. This is not to say that the movie had no business trying to be funny, but rather that the tone of the jokes is all wrong. They went for slapstick, even though the material is screaming for a dry wit. There is a movie to be had here, but the film plays out like a teen Elsa locked up in her castle: it’s eager to please, but lacks the confidence to stand on its own. This is not the only thing “Maleficent” has in common with “Frozen,” but we’re not about the spoil the other one. The story is “Sleeping Beauty” in a parallel universe. 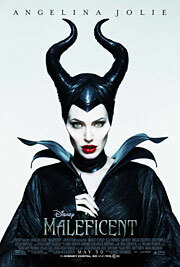 Maleficent is a fairy that lives in the enchanted moors with a wealth of fantastical creatures. One day she meets a boy named Stefan from the nearby kingdom. Though the humans and woodland creatures stay away from each other, they become friends, and ultimately more than that as they grow older, but Stefan (played as an adult by Sharlto Copley) thirsts for the throne and, knowing the king’s desire to conquer the moors and exploit its untold riches in gems, leverages his boyhood romance with Maleficent (played as an adult by Angelina Jolie) in order to betray her – he cuts off her wings – and succeeds the king upon his death. When Stefan and his wife have a baby girl, an embittered Maleficent exacts her revenge: she places a curse on the baby that will cause her to fall into an endless sleep on her 16th birthday. Stefan entrusts three pixies (long story) to take care of daughter Aurora (played as a teen by Elle Fanning) and to hide her away until after she turns 16, thus outlasting Maleficent’s curse, but Maleficent finds her rather quickly, and watches her from the shadows. Before long, Maleficent finds herself serving as Aurora’s unofficial guardian (the pixies are idiots, basically), even saving her life on more than one occasion. Maleficent eventually grows fond of Aurora, and this, naturally, complicates things. Are you intimidated by beautiful women? Be honest with yourself. Does this apply to you? It applies to most men, so there’s nothing to be embarrassed about. Frankly, just acknowledging this can be a great first step towards improving your dating skills with women, whether you’re a bumbling novice or someone who is generally successful with women but wants to get better. Forbes recently brought up a similar question in the contest of Angelina Jolie and Billy Bob Thornton. This went more into the relationship dynamics, as Thornton feels like he screwed up the marriage and said, “I blew it because I didn’t think I was good enough for her.” She’s particularly intimidating for a host of reasons, but it raises the narrower issue of how to attract and date beautiful women. Most pick-up artists have great advice in this area, and the basic idea is that you can’t act like all the other guys who fawn over them or try to win them over with money or status (if that’s even an option). The key is to stand out by acting differently, and it all goes back to your own attitude and confidence. You can start thinking about this issue with two articles from David DeAngelo. The first explains his basic “cocky and funny” strategy, and the next one specifically addresses the secrets of dating beautiful women. The idea is similar to the idea of negs from Mystery and Style. Playfully teasing a beautiful women and not fawning over her will completely change the dynamic. One of the keys to improving your dating skills by reading the pick-up artists is simply to avoid the common mistakes you and other guys have been making for years. The light bulb will go up immediately, as you see that your natural impulses are often wrong when trying to attract women, unless you’re a natural of course . . . Check out our dating tips page for more tips from the best pickup artists.